Engagements are such a wonderful celebration, the beginning of a new life as two people begin their journey together. For the family and friends, it’s a chance to show their love and affection for the couple, and then help them take those first steps towards a new life together. For any newly engaged couple in your life, you want to buy a gift that reflects the joy and happiness of the occasion, but generic gifts are never really personal enough to show that. Our range of personalized engagement gifts do more than celebrate an event, they are engagement gifts that celebrate the two people involved, and that adds something very special to your engagement gift. We offer a complete range of high-quality, beautiful gifts that you can completely personalize, engagement gifts that are just for the people you love. Our range of engagement gift personalization includes using pictures, names, favorite activities, songs, books, phrases and more depending on the gift, so that each one tells the story of the engaged couple, adding meaning and making these gifts that will be treasured forever. Our range covers everything for any engagement, each one personalized for the engaged couple. For couples planning their engagement party, make it even more especial with personalized cake topers, glasses, decorations and more. Each of our personalized engagement party items can include your names and special messages, favorite pictures or anything else you may want to add that means something to you. Its your special celebration, and with our personalized engagement glasses and decorations, you can have something to keep and treasure that will always remind you of that wonderful evening. 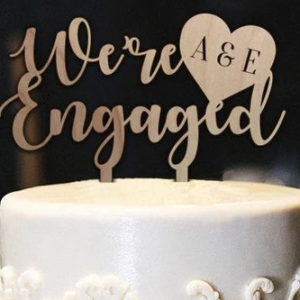 Let your friends and family see the message you want to send, from invitations to table decorations, cake toppers to beautiful glasses that all commemorate that special Engagement party. When it comes to finding the right gift for a newly engaged couple, it can be difficult to find something just right. But with our personalized engagement gifts, you can be sure your choice will be a unique engagement gift they will love and treasure. We offer a vast range of high-quality gifts that you can personalize to make them even more special. From pictures, names and favorite quotes to personalized messages and anything else you can think of, we help you make any engagement gift a unique, personal message to the happy couple. Why give something generic when you can pass on a message from the heart. We help you create unique engagement gifts that let them know just how much you care, providing the personalized engagement memento that will bring back those happy memories for a lifetime. Make sure your present lets them know just how special they both are with our wonderful range of personalized engagement gifts that you will love to give, and they will love to receive.